What Day Of The Week Is November 14? 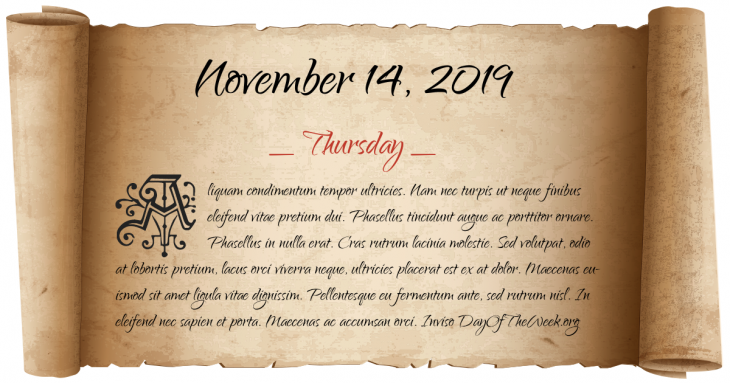 November 14, 2019 is the 318th day of the year 2019 in the Gregorian calendar. There are 47 days remaining until the end of the year. The day of the week is Thursday. World War II: In England, the city of Coventry is heavily bombed by German Luftwaffe bombers. Coventry Cathedral is almost completely destroyed. Who were born on November 14? Giorgios Georgiadis, Greek footballer for PAOK F.C.